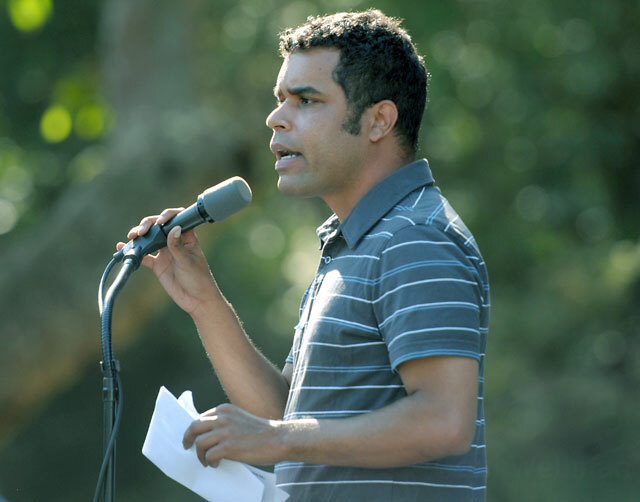 Daraka Larimore-Hall, Santa Barbara’s irascible, highest-profile Democratic activist, sparked a nationally watched political drama last week that led to the sudden resignation of California’s state party chair. In a letter circulated to Democratic leaders on social media, Daraka surfaced what he called “credible, corroborated and utterly heart-breaking allegations” of sexual harassment and assault made by party staffers against then-chair Eric Bauman. Although he kept the names of victims who had shared their stories with him confidential, it took L.A. Times star Sacramento reporter Melanie Mason just two days to locate 10 people who confirmed allegations about Bauman’s behavior, several of them on the record. Bauman routinely “made crude sexual comments and engaged in unwanted touching or physical intimidation” in the workplace and other professional settings, the newspaper reported, detailing a series of episodes involving his graphic language and gross behavior. Ironically, the sexual harassment story broke as California Democrats celebrated extraordinary midterm election victories, having captured seven Republican congressional seats, swept every statewide office, and achieved super-majorities in both houses of the Legislature. Among the issues that motivated Democratic voters was the #MeToo movement, which has toppled a series of prominent male executives in media, corporate, political, and other organizations because of sexual misconduct. During the campaign, Bauman himself highlighted the importance of the issue, declaring that Democrats have a “100 percent no-tolerance policy” on sexual harassment. A 59-year-old gay married man, Bauman has been a fixture of the state party for decades. A Bronx-born, old-school, hard-drinking pol, he served as leader of the L.A. County committee for more than 15 years. Last year, he was narrowly elected to the party’s top post only after a bitter clash that highlighted deep ideological differences between backers of Bauman, many of whom supported Hillary Clinton for president, and the more progressive wing of the party, which favors the more liberal politics of Bernie Sanders. Now that intraparty divide may be exposed again, as party activists and members begin to prepare for their next state convention in May, when they will elect a new chair. Daraka, a high-ranking executive of the state party and former longtime S.B. county committee chair, was the first to demand that Bauman step down. “As a Vice-Chair of the California Democratic Party, I will not tolerate sexual harassment or assault on any level,” he wrote to his political colleagues. “As California Democrats, we are better than this,” he added. In response to our questions, Daraka said that he is undecided about whether he will seek the party’s top job. FUN WITH NUMBERS: As vote counting finally nears its conclusion, the full scale and scope of the Democrats’ triumph in California is coming into focus. In an excellent series at CALmatters, number-crunching reporter Ben Christopher teased out some of the most striking trends. Women, nearly all Democrats, won elections in record numbers in the state. Among 54 winners, 19 will be in Congress, 29 in the Legislature, and three will hold constitutional offices, including Lieutenant Governor-elect Eleni Kounalakis, Treasurer-elect Fiona Ma, and Controller Betty Yee. Men still hold two-thirds of state elective offices. Republicans in Congress will represent only 13 percent of the state’s population beginning in 2019, half of the current 26 percent. Although Rep. Kevin McCarthy of Bakersfield was just elected the GOP’s House leader in Washington, he oversaw a debacle in his home state, as his party won only seven of 53 seats in the delegation. Donald Trump’s policies and politics pushed his party not only out of its traditional base in Orange County but also out of every House seat touching the Pacific, as the GOP lost every district where Trump did not win a majority in 2016. The small cohort of voters to be represented by Republicans is overwhelmingly white and poorer than the statewide average; only 16 percent hold a college degree.